The Eye Dazzler | Painted Ponies Everyday Figurines | One Price Low Flat Shipping! 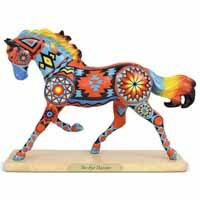 From the Trail of Painted Ponies 2018 Summer Set, The Eye Dazzler, featuring a vibrant array of Navajo Native American patterns, colors, and symbols. Designed by artist, Sarah C. Geis. Made of stone resin. Measures 6.5" tall.